The novel starts as a man named Shadow Moon is getting ready for his release from prison, after three years inside. Shadow has spent his time practicing coin tricks and reading a copy of Herodotus’s Histories borrowed from his cellmate Low Key Lyesmith. Two days before he is supposed to be allowed to go back to his beloved wife Laura, Shadow finds out that his wife has died in a car accident. He is released early and catches a plane back to his home in Eagle Point, Indiana so that he can attend the memorial. On the plane, Shadow falls asleep and has a strange dream about a man with a buffalo head who tells him to believe “everything.” When he wakes, he meets a strange man who calls himself Mr. Wednesday and offers Shadow a job. Shadow refuses, then gets off the plane early to avoid talking to Mr. Wednesday any more. Meanwhile, the narrator describes a goddess in Los Angeles named Bilquis practicing her particular brand of sexual magic, swallowing a client whole when he agrees to worship her with his body. Shadow rents a car and starts to drive home, stopping at a bar for dinner. Mr. Wednesday is at the bar, and he offers Shadow the job again. This time, Shadow accepts, drinking three glasses of mead with Wednesday to make the deal official – promising to be Wednesday’s assistant and to hold Wednesday’s vigil if Wednesday ever dies. Mad Sweeney, a friend of Mr. Wednesday’s who calls himself a leprechaun, arrives at the bar and shows Shadow how to make a gold coin appear, seemingly out of thin air. Shadow thinks this is just a normal coin trick, and Mad Sweeney shows him how to do it too. Shadow gets so drunk from the mead that the next day he forgets what happened, and just wakes up with a gold coin in his pocket. Before starting his job as Wednesday’s assistant, Shadow asks to go to Laura’s funeral. At the funeral service, Shadow finds out from Laura’s best friend Audrey Burton that Laura died while in the process of having an affair with Audrey’s husband. Shadow is hurt, but tries to forgive Laura. He throws the gold coin he found in his pocket into Laura’s grave, then goes to meet Wednesday at a hotel. On his way, Shadow is kidnapped by a “New God” named Technical Boy, who tells Shadow to give Wednesday the message that the Old Gods are obsolete. Shadow finally makes it to the hotel, and tries to go to sleep despite disturbing dreams of forgotten gods. In the middle of the night, his wife Laura appears, now a walking corpse, and promises to protect Shadow now even though she betrayed him in life. The novel then switches to tell of the first Northmen who came to America and brought the Norse gods Odin, Tyr, and Thor with them, planting these gods of death and deception on American soil. Back with Shadow, Wednesday tells Shadow to drive him to Chicago, where Shadow meets the Zorya sisters and Czernobog. Wednesday tries to convince Czernobog to join his fight against the New Gods, but Czernobog doesn’t agree until Shadow wagers his life on a game of checkers. Shadow loses the first game, giving Czernobog the right to kill Shadow with a hammer, but wins the second, meaning that Czernobog has to help Wednesday first. That night, Zorya Polunochnaya, the moon sister, gives Shadow a silver Liberty coin and blesses him with protection. Shadow and Wednesday spend the next day robbing a bank, showing Wednesday’s affinity for cons, deception, and tricks. Shadow himself is fairly adept at taking on a new identity for the sake of the grift. Wednesday then tells Shadow to drive them to the House on the Rock, a strange tourist attraction that Wednesday calls one of the most important places in America. Wednesday meets up again with Czernobog and another god called Mr. Nancy. They all ride a carousel that transports them to a huge Norse hall, where a few gods are assembled. Shadow finds out that Wednesday is really the Norse god Odin, and that all the gods came to America with the immigrants who believed in them. Mr. Nancy, with his talent for stories, and Mr. Wednesday, with his ability to make rousing speeches, try to convince the gathered gods to fight against the New Gods who have stolen their power, but the other gods are not interested in taking that risk. Everyone goes back to the House on the Rock, and Shadow is captured by Mr. Wood and Mr. Stone, two hitmen for the New Gods. They take him to an abandoned train in the Wisconsin woods, where they beat him and interrogate him about Mr. Wednesday’s plans. Wednesday holds on to his Liberty coin and gives away nothing. Early the next morning, Laura appears and kills Mr. Stone and Mr. Wood so that Shadow can escape. Shadow walks south through the woods, following a raven who tells him to go to Cairo and find “Jackal.” Shadow reaches a gas station, where the attendant tells him Cairo is in Illinois and sells him a used car. Shadow drives down to Cairo, picking up a hitchhiker named Sam Black Crow along the way. Sam, a half-Cherokee girl, tells Shadow a story about Odin where a sacrifice that was supposed to be symbolic turns into a real death. Shadow gets Sam to her destination, then spends the night in a motel where the TV comes to life and offers him fame and fortune if he joins the New Gods. Shadow keeps driving, finally reaching Cairo where he finds the Ibis and Jacquel Funeral Parlor. Mr. Ibis welcomes Shadow to live with them and help out with their work as funeral directors and autopsy prosecutors. Shadow feels at peace in Cairo, listening to Mr. Ibis’s stories of how different gods came to America and meeting Bast – a cat goddess who helps heal the many injuries Shadow has accumulated on his journey so far. After spending the beginning of December in Cairo, Shadow runs into Mad Sweeney, who begs Shadow to give the gold coin back. After hearing that Shadow gave the gold coin away, Mad Sweeney drinks himself to death. On Christmas Eve, Mr. Wednesday reappears and takes Shadow back north, giving him the identity “Mike Ainsel” and sending him to live in a small Wisconsin town called Lakeside. That night, Shadow has a dream that he is reborn out of the earth and meets the star people, after the Buffalo Man tells him to look for a thunderbird in order to bring Laura back to life. On Christmas Day, Shadow makes it to Lakeside, where an old man named Hinzelmann helps show him around the town. Everyone he meets in Lakeside repeats what a good town it is. Shadow meets the local policeman, Chad Mulligan, and settles into his apartment for the freezing Wisconsin winter. He joins in the town tradition of buying a raffle ticket to guess when a car parked on the frozen lake will crack through the ice, marking the arrival of spring. Shadow tries to find out more about thunderbirds so he can help Laura, even dreaming about a thunderbird one night. Every once in a while, Wednesday comes to get Shadow so that Shadow can accompany him on visits to different gods, including the goddess Easter in San Francisco. Easter seems to hate Wednesday, but takes a liking to Shadow and reluctantly agrees to help Wednesday. When Shadow returns from San Francisco, Chad gives him the bad news that one of the teenagers in the town, a young girl named Alison, has disappeared. Shadow learns that this is only the latest in odd disappearances that seem to happen every winter. Wednesday takes Shadow again to South Dakota where they have to sneak “Backstage” behind Mount Rushmore on foot to avoid a trap set by the New Gods. While Backstage, Shadow touches a bone that transports him into the body of a man named Mr. Town, who works for Mr. World, the leader of the New Gods. Shadow thinks that Mr. World’s voice sounds familiar, but can’t place it. Shadow and Wednesday emerge from Backstage at the house of Whiskey Jack (Wisakedjak), a Native American hero. Whiskey Jack refuses to join Wednesday’s lost cause and tells Shadow that the dead must stay dead even if he finds a thunderbird. In February, Shadow makes more journeys with Wednesday, and takes long walks through the Wisconsin forest when he is in Lakeside. One walk takes him to a graveyard where Laura is waiting. Laura asks Shadow if he is really alive, and Shadow is hurt by the question. Meanwhile, the war between the gods starts to take lives, with Bilquis ending up as one of the first casualties. Wednesday calls Shadow to say that he is going to attend a peace talks meeting with the New Gods. One day Shadow goes to dinner with his neighbor, who turns out to be Sam Black Crow’s sister. Sam is there visiting, and demands to know the truth about Shadow. Shadow tells her, after Sam assures him that she can believe impossible things, but their conversation is interrupted when Audrey Burton, ostensibly visiting her cousin Chad, shows up and demands that Shadow be arrested for skipping parole. Chad reluctantly takes Shadow down to the police station, where he finds out that Shadow is in fact an ex-convict. While in the Lakeside holding cell, Shadow sees a live feed of the Peace Talks between the Old and New Gods where Wednesday is murdered, shot through the head on camera. Mr. Nancy and Czernobog arrive to get Shadow out of jail, both shaken by Wednesday’s death. The novel flashes back to the first people to arrive in America, following the orders of their mammoth god despite the misgivings of their shaman woman. The shaman woman sacrifices herself so that the tribe can reach America safely, but her distrust means that these first people will eventually be overthrown in America. The tribe soon forgets about their mammoth god as they create new gods on American land. After Wednesday’s death, the Old Gods band together to avenge him, finally agreeing to fight the New Gods. Shadow insists on sitting Wednesday’s vigil (as he had promised to), which means being tied to a tree for nine days. The New Gods hand over Wednesday’s body in the center of America, a small park outside of Lebanon, Missouri, where no god has any power. There, Shadow finds out that his old cellmate Low Key is actually the Old God Loki, who has defected to the New Gods’ side. Mr. Nancy and Czernobog take Shadow and Wednesday’s body to an ash tree in Virginia, called the “world tree.” Three women (The Norns) tie Shadow to the tree to sit Odin’s vigil. Shadow’s nine days are a wash of pain and hallucinations, including a vision of an elephant-headed god who tells Shadow, “it’s in the trunk.” Laura visits Shadow again and offers to cut Shadow down, but Shadow tells her to go get a drink of water from the fates to revive herself as her body continues to decay. Shadow dies while on the tree and finds himself in the underworld. There, Zorya Pulunochnaya takes back her Liberty coin and turns it into a moon to light Shadow’s way. He chooses to walk the path of hard truths, finding out that his father was actually Mr. Wednesday. He then goes through the Egyptian Hall of the Dead, where Bast, Mr. Ibis, and Mr. Jacquel weigh his heart and give him the choice of where he wants to go next. Shadow asks for nothing, just rest. Meanwhile, the gods all gather at a tourist attraction called Rock City on Lookout Mountain in Tennessee. Laura goes to the farmhouse and gets water that restores her body to a freshly dead corpse, then meets Mr. Town, who has been sent to cut a stick for the ash tree where Shadow hangs. At the same time, Easter goes to the ash tree to revive Shadow. At Rock City, Mr. World kills Technical Boy, one of the New Gods, and dedicates the death to Odin, starting Mr. Wednesday’s revival. Shadow stays in darkness for a while, then finds Whiskey Jack, who tells him that America is not a place for gods. The land is the most important thing in America, he says, and anything the gods do is only to serve themselves. Shadow realizes that Wednesday’s plan all along has been to use a war between the gods to give himself power, as Loki is going to dedicate all the deaths to Odin before the fighting starts. Back at Rock City, Laura has killed Mr. Town and stolen the ash stick. She finds Mr. World and sacrifices herself to use the ash stick to kill Mr. World before he can throw the stick as a spear and dedicate the war to Odin. Meanwhile Easter resurrects Shadow and Shadow rides a thunderbird back to Rock City. Shadow finds Mr. World and figures out that it is really Loki in disguise, part of the two-man con that Loki and Mr. Wednesday have been pulling. Shadow then goes Backstage at Rock City and tells all the gods the truth, about both Mr. Wednesday’s trickery and the tentative place of all gods dependent on human belief in America. The gods all leave, refusing to fight each other now. The Buffalo Man congratulates Shadow for taking his own godly power and using it for good to honor the land of America. With the battle diffused, Shadow finds Laura and takes the gold coin back so that she can move on and die for good. Shadow leaves Rock City with Mr. Nancy, but soon figures out that he has to get back to Lakeside before the car falls through the ice. Shadow gets back to Lakeside on March 23rd, the exact day he bought for the raffle. He opens the car’s trunk, finding Alison’s body inside. Shadow figures out that Hinzelmann is actually a dark god who sacrifices a child each year so that Lakeside can prosper. Hinzelmann admits this, and Chad Mulligan overhears and kills Hinzelmann. With the Lakeside mystery solved, Shadow goes to Chicago to fulfill his promise and let Czernobog hit him with his hammer. Czernobog lets Shadow live, now that spring is here and Czernbog is turning into his kinder identity, Bielebog. Shadow, finally free, goes to Reykjavik, Iceland, where he meets an older incarnation of Odin, his father. Mueller, Bethany. "American Gods Plot Summary." LitCharts. LitCharts LLC, 21 Jun 2017. Web. 22 Apr 2019. Mueller, Bethany. "American Gods Plot Summary." LitCharts LLC, June 21, 2017. 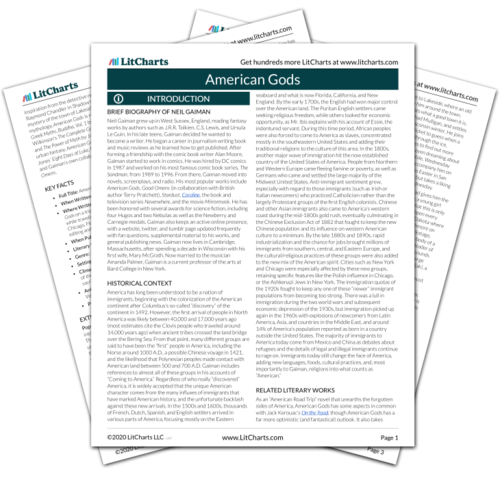 Retrieved April 22, 2019. https://www.litcharts.com/lit/american-gods/summary.